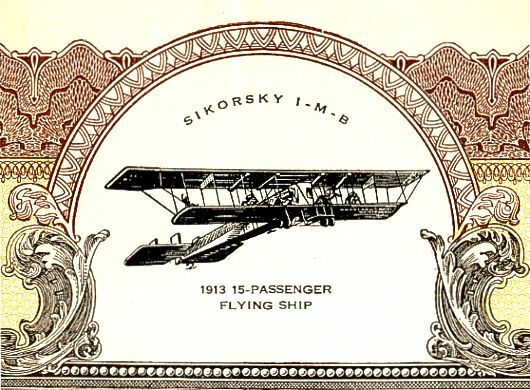 Beautiful RARE uncancelled certificate from the Sikorsky Aero Engineering Corporation issued in 1923. This historic document was printed by the Broun Green Company, NY and has an ornate border around it with a vignette of the Sikorsky I-M-B 1913 15 Passenger Flying Ship. This item has the signatures of the Company�s President, Igor Sikorsky and is over 81. This is the first time we have had this for sale and know of only one other. Certificates were redeemed in 1928 when the company was acquired by United Aircraft Company. The certificate has been folded showing some wear on the folds. This is a very RARE certificate and is historically important. Igor Sikorsky was born in Kiev, Ukraine, as the youngest of five children. Sikorsky's father was a professor of psychology. His mother also was a physician but didn't work professionally. While homeschooling young Igor (until the age of nine) she gave him a great love for art, especially in the life and work of Leonardo da Vinci, and the stories of Jules Verne. He started to experiment with model flying machines, and by age 12 he had made a small rubber-powered helicopter. Sikorsky studied at the Naval War College in St. Petersburg from 1903 to 1906, and from 1907 to 1909, but did not finish formal studies. For a short time in the years (1906-1907) he studied engineering in Paris. In 1908 Sikorsky and his father traveled to Germany, there he saw a newspaper picture of Orville Wright and his plane. Sikorsky later said about this event: "Within twenty-four hours, I decided to change my life's work. I would study aviation." With financial backing from his sister, Sikorsky returned to Paris in 1909 to study aerodynamics. Paris was then the center of aviation in Europe. He met several French pilots, including Louis Bleriot, the first person to fly across the English Channel. Sikorsky returned to Kiev the same year and started to experiment with flying machines. In 1912 Igor Sikorsky became Chief Engineer in the Russian Baltic Railroad Car Factory in Saint Petersburg. In 1914 he was awarded the Degree in Engineering "Honoris Causa" by St. Petersburg Polytechnic Institute. His S-6-B airplane won a small order from the Russian Army. Other early work included the construction, as chief engineer, of the first four-engine aircraft, the Bolshoi Baltiski, which he called the Grand. He was also the test pilot for its first flight, on 13 May 1913. Sikorsky's planes were used by Russia as bombers in World War I (see Ilya Muromets) and he was decorated with the Order of St. Vladimir. After World War I Sikorsky briefly became a engineer for the French forces in Russia during the Russian Civil War, that ended with the Armistice. Seeing little opportunity for himself as an aircraft designer in war-torn Europe (and particularly Russia, ravaged by the October Revolution and Civil War), he emigrated to the United States in 1919. In the U.S., Sikorsky first worked as a school teacher and a lecturer looking for an opportunity in aviation industry. In 1923, helped by several former Russian army officers, he formed the Sikorsky Aero Engineering Company. Sikorsky Aero Engineering Corp. was located in Westbury, Long Island. The firm began its activities, on a chicken farm, by making a single S-29A (in which the A stood for America), a large two-engine fourteenpassenger biplane transport aircraft with a metal structure. The tough and reliable S-29A was actually used by movie mogul Howard Hughes in his movie �Hell�s Angels.� Sikorsky built a few more one-off aircraft, including the S-35, a twin-engine fourteen-passenger transport aircraft. Among Sikorsky's chief supporters was composer Sergei Rachmaninov who introduced himself by writing a check for $5,000. In 1928, Sikorsky became a naturalized citizen of the United States. The next year, Sikorsky Aero Engineering Company was purchased by and became a subsidiary of United Aircraft, itself now a part of United Technologies Corporation. The company manufactured flying boats such as the S-42, used by Pan Am for trans-atlantic flights and known as Pan Am Clippers. Sikorsky had experimented with helicopter-type flying machines while in Russia. He brought his work to fruition on 14 September 1939 with the first flight of the Vought-Sikorsky 300, a machine with a single three-blade motor powered by a 75 horsepower (56 kW) engine. Its first free (untethered) flight was on 13 May 1940. The VS-300 was not the first successful helicopter to fly, but it was the first of the single-rotor configuration that became the world standard. Sikorsky Aero Engineering Corporation became Sikorsky Aircraft Corporation in 1928. Sikorsky Aircraft Corporation is currently an American aircraft and helicopter manufacturer. It was founded 1923 by a Russian-American aircraft engineer Igor Sikorsky, who made the first stable, single-rotor, fully-controllable helicopter to enter large full-scale production in 1942, upon which the majority of subsequent helicopters were based (though he did not invent the helicopter itself). The company became a part of United Aircraft in 1934, now United Technologies Corporation (UTC), and remains one of the leading helicopter manufacturers, producing such well-known models as the UH-60 Black Hawk and SH-60 Sea Hawk, as well as experimental types like the Sikorsky X-Wing. It is a leading defense contractor. Sikorsky has supplied the helicopter of the President of the United States, Marine One since 1957. (Note that in January 2005 the U.S. Government selected Lockheed Martin's AugustaWestland EH101-based entry as the replacement to the current Marine One aircraft, which caused an outcry from many in Sikorsky Aircraft's home state of Connecticut.) Sikorsky's VH-3 (H-3 Sea King) and VH-60 (UH-60 Black Hawk) currently perform this role. UTC has recently acquired Schweizer Aircraft Corporation, which is now a subsidiary of Sikorsky. The product lines of the two firms are complementary, and have very little overlap, as Sikorsky primarily concentrates on medium and large helicopters, while Schweizer produces small helicopters, UAVs, gliders, and light planes. The Schweizer deal was signed on August 26, 2004, exactly one week to the day after the death of Paul Schweizer, the company's founder and majority owner. Sikorsky's main plant and administrative offices are located in Stratford, Connecticut. Other Sikorsky facilities are in West Haven, Shelton, and Bridgeport, Connecticut; West Palm Beach, Florida and Troy, Alabama. Other Sikorsky-owned subsidiaries are in Trumbull, Connecticut; Coatesville, Pennsylvania and Grand Prairie, Texas; and the company has branches around the world. History from Wikipedia and Encyberpedia.